The famed statue of Hans Christian Andersen's Little Mermaid, one of Copenhagen's biggest tourist draws, has been vandalized ... again. The oft-attacked 5.5-foot-high statue was toppled from its stone base at the entrance of the Copenhagen harbor early Thursday. Police learned what happened at about 3 a.m.
"Explosive or tools might have been used to knock her over," police superintendent Henning Schou Kofoed said. "She was fastened with four strong bolts that all were bent." Police said several witnesses heard an explosion shortly before 2 a.m. No arrests have been made. Vandals have often targeted the 90-year-old statue. She has been beheaded twice. Once, her arm was amputated. Hooligans have doused her in paint six times, most recently in May. Each time, city officials fix and clean the statue, which draws at least 1 million visitors a year. The Little Mermaid will need several repairs this time. She had a 2.8-inch wide hole in the knee and a smaller hole in the wrist, possibly from explosives, as well as scratches on her face. 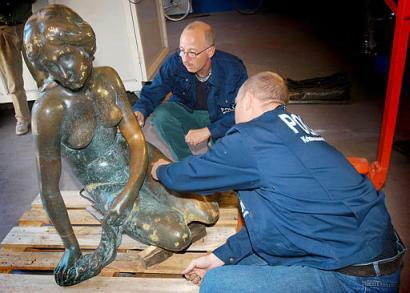 The statue is based on a mythical sea king's mermaid daughter who, according to the Hans Christian Andersen tale, falls in love with a prince and must wait 300 years to become human.